We have had a few anxious emails asking what exactly we are looking for in entries for this competition, (apart, of course, from poems that reach out and intoxicate the reader). I’m going to try to answer this, but unfortunately, for those of you who like clear and concise instructions, it’ll probably turn out to be in my usual indirect way. Here goes. The male blackbird that lives in my back garden will just hop or flit a few paces away when it sees me. Now that ice has re-appeared on the car windscreen I put out apples. In the back garden these go under the bay tree a few paces from the glass patio style doors (I have no patio). This blackbird will feed while I watch from behind the doors. The front garden blackbirds (it’s a different male with a sprinkle of pale feathers on the neck) get their apples under the little fig tree, a bit further from the house. They sit in the tree or on top of the fence, checking that I’m not in sight before they drop down to feed. This male is noisy and quick to fly off if I’m in sight. He has had a female companion for several weeks. The confiding male in the back garden has an on/off relationship with a visiting female. So we have place (small town garden), nature (birds and how they deal with winter and each other): and poet (me), speculating. I’m aware that the paragraph includes not just my observation but my love for these creatures: I’m also aware that I’ve a life long struggle with anthropomorphism in the writing. I’m ascribing ‘human’ feelings to fellow creatures. I’m aware that I’ve recently started to realise that most creatures have what we call feelings, that we share this way of trying to make sense of stuff, and I don’t think we can sheer off from the responsibilities involved in what we do to creatures by the ‘Bah Humbug! Anthropomorphism!’ escape route. As far as I’m concerned any of the above can be a starting point for a poem that I’d be interested to read. Just the blackbird, just the apple, just the tree, never mind the intrusive apparatus of my conjectures. I was driving back from Suffolk to Norfolk the other Sunday and caught part of a Radio 4 poetry broadcast of Andrew Motion. He was putting poems together based around facts and conversations. At one point scientists working in Antarctica were talking about the ice cores they had drilled up from thousands of years ago (when early humans were wandering in the savannah) and how the air trapped in them is very different from the air we are breathing today. Today’s air has levels of carbon dioxide in it that life has never previously been exposed to. Andrew made a concise and urgent poem out of this scientific fact. He didn’t say so directly but the point I took from what was in the poem and the scientist’s comment was that we are literally on the point of drowning in our own excrement, both ourselves and the other creatures we share the planet with. So I’ve given you two polarities. ‘Nature and Place’ in my garden, and ‘Nature and Place’ in a planet wide context. There’s poetry to be made that incorporates either extreme, and also anywhere you choose to alight upon as the middle ground. My own thinking about the middle ground led me to Shakespeare’s ‘A Midsummer Night’s Dream’, a key piece of poetry for me since I first met it around the age of 12. MSND was almost my first encounter with Shakespeare, though I had, a couple of years earlier, learned by heart Henry V’s speech before Harfleur and recited it heroically under the cedar tree at Coombe Hill House for Miss Prest, who seemed to have an inexhaustible supply of navy blue silk blouses, buttoned to the neck. I kept quiet about my love for the play because it wasn’t cool to love poetry and Shakespeare was tricky, as I was then at a boys’ school and there was a lot of innuendo chucked at those of us who read girls’ parts (chuckle). A lot of the action takes place in a wood. I’d been lost in a wood as a small child with my mother and a pram, and there were already woods that I walked in that I feared and woods that I loved. The other literary woods in my head by then were the Wild Wood in ‘Wind in the Willows’, the forest in Disney’s ‘Snow White’, the Wood where the Babes got lost and numerous other Grimm woods, and so on. I had not yet got to Dante’s ‘selva oscura’, nor either of Frost’s famous woods, but I did know enough to recognise the metaphoric impact – even if I didn’t know what to call it. I’d love to write a poem which conjures up the joy Shakespeare’s work fires in me (‘It fell upon a little western flower/ Before milk-white, now purple with love’s wound’). But I doubt I’d get one as good as Kate Wakeling’s ‘Moth’, which you can find in her pamphlet ‘The Rainbow Faults’. So here is a third paragraph full of clues about ‘Nature and Place’, in this case a quick look at what happens when we abandon the protection of our manners and our walls and risk being naked in the wild. These paragraphs are not literal instructions, just brief hints on the where and how of poetry. Do, please, just let the poetry flow down into your fingertips and onto the page. You can enter the Nature and Place Poetry Competition here. 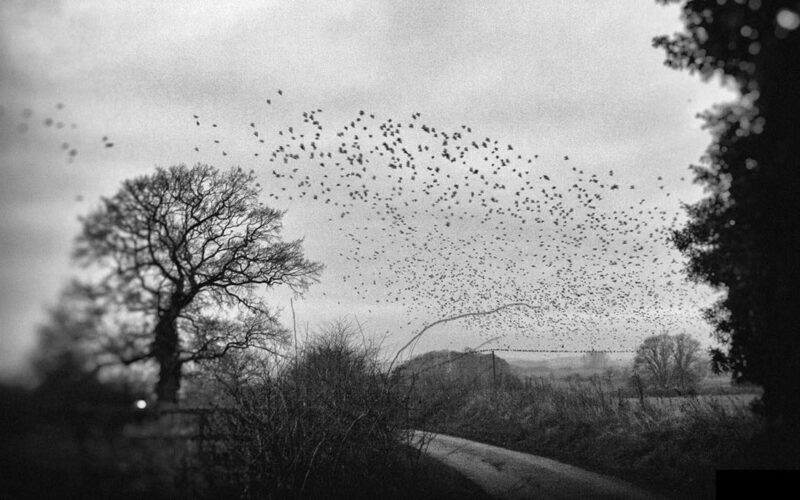 Photograph: Corvid Roost, Buckenham Carr, courtesy Nick Stone.